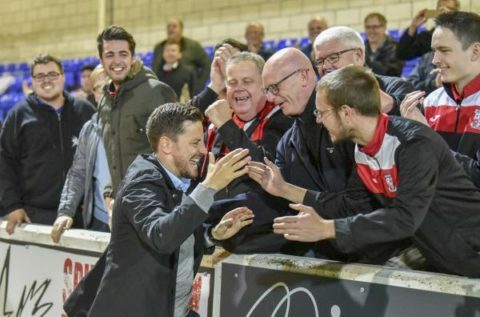 ANTHONY LIMBRICK has heaped praise on the Woking supporters as the Cards prepare for yet another tough test at the Laithwaite’s Community Stadium. Woking rose to third in the National League table on Tuesday, after goals from Kane Ferdinand and Jamie Philpot saw them to a comfortable 2-0 victory away at strugglers Chester. Fourth-placed Dagenham will prove a different challenge for Limbrick’s young squad, with the 34-year-old insisting that his players’ work-rate has been for the supporters. Woking put their joint best home record in the league to the sword this weekend, and Limbrick will be hoping striker Jamie Philpot can continue his fine flurry of form as the young striker, with the Milwall loanee scoring in each of his last three consecutive games. Academy player Lazar Stojsavljevic made his first team debut at Chester and very much impressed and will be fighting for a place this weekend. Fabio Sairava made his comeback against Chester also and looked as if he had never been away with an assured performance. Richard Orlu managed to make it to the bench but with Josh Staunton and Jordan Wynter playing so well recently, it is unsure whether the Cards’ skipper will fit straight back into the starting line-up. Jason Banton was injured last week in training whilst Louis Ramsay continues to recover from a long-term injury so both will be absent for the game at the Laithwaite’s Community Stadium. Dagenham have started off the season well under the experienced John Steel, but the Daggers seem to be draw specialists away from home having drawing five out of seven of their away games this season. Corey Whitely is the league’s top goal scorer with eight goals this term but has failed to score in his last five away games. The head into the game on the back of a 1-1 draw away at Aldershot Town, with Sam Ling snatching an equaliser with just four minutes remaining at the EBB Stadium. Despite sitting below the Cards in the table, Limbrick is wary of tomorrow’s opponents.